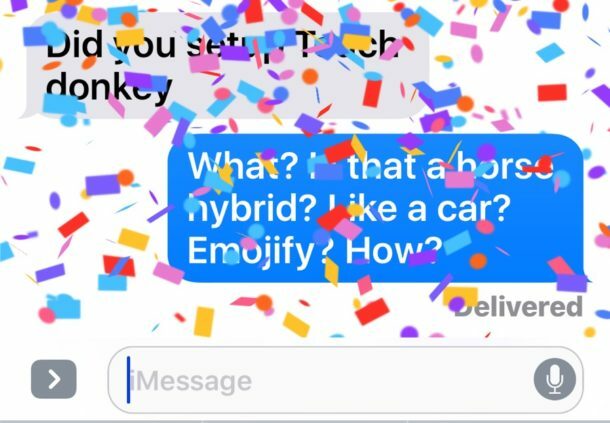 The modern releases of iOS allow you to see and send fun iMessage effects while retaining the Reduce Motion setting to remove the sometimes nauseating zoom effects found elsewhere throughout the iPhone and iPad user interface. 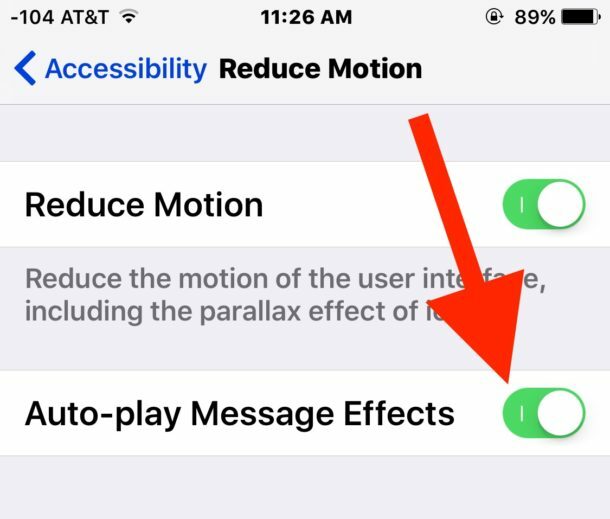 Previously if you enabled Reduce Motion you would also cause iMessage effects to not work, but now you can have your iMessage Effects cake and eat your Reduce Motion too. This is an easy settings adjustment to make that requires a modern version of iOS, anything past 10.1 will have the ability to enable both Reduce Motion and iMessage effects. If you do not see these dual settings then you will need to update iOS first. Remember, using Reduce Motion enables a transition effect in iOS in lieu of the zips and zooms that inspire motion sickness in some people, and the transitions also tend to be faster which can offer a perceived performance boost to iPhone and iPad as well. Of course you can also choose to disable the iMessage effects through toggling the “Auto-play Message Effects” setting OFF instead, so if you aren’t thrilled with the message effects at all it’s easy to turn them off, regardless of how you prefer your broader iOS transitions and animations to appear. I’m sorry to say that recent software changes have destroyed my faith in Apple. Under Steve Jobs, “it just worked.” Now, for example, my desktop wallpaper is no longer rescaled but the top left corner used; my email takes ages to sync between devices instead of updating in the background; and there are huge numbers of “features” I don’t want which complicate normal simple use. Why does Photos not carry across descriptions, which are central to searching my 18000 photo library, when I *don’t* need artistic presentations of my images? Does Apple run new ideas past a panel of users? I think Steve Jobs had a pretty good idea of what users thought. I have to agree. Every update brings in useless things that make it harder to use. The new mandatory fingerprint ID (if you don’t use, you need a passcode) is the last straw. All stupid things like “effects” in messages are appealing to what audience? Young teenagers. I’m seriously thinking of going off Apple. I’ll be due to upgrade to a MacBook (from Mac mini) plus a new iPad in a year or so, I expect. The prices are unreal, especially for Canadians due to the exchange rate. Sorry, but that is bull! I keep seeing this around the web and I don’t know if people are being brainwashed some how or what? For dull releases I blame the rumor sites and spoiling the surprises that we used to have. As for stuff just worked under Jobs is false as well! Remember MobileMe and the mess Jobs thought that was? Long releases of new products between the iPod, iPhone, iPad, Apple Watch, etc. OS X was far buggier in the past as well! I had to hold my breath on every update as being an Admin hoping it would break anything, but for the past 5 years or so things have been stable for the most part. I believe Apple is still the same Apple with killing things that upset us most and doing the same work that gets spoiled by rumors. If you have issues then I hope you are reporting them as bugs under bugreport.apple.com then so you can get your problems resolved. Poor Rod Dalitz. He lost his faith. I guess he could always throw all his Apple stuff in the trashcan and get PC and an Android phone and then he could be happy. What does somebody do with 18,000 photos? I only wish there was a way to turn off all the gratuitous effects. There was a sort of hack that involved a crazy sequence of clicking and swiping that would temporarily disable the window zooms – the phone was so much snappier without it. and all the windows soon will be gone. Plus your battery will lost a little longer. Well you can look at the photo’s now and then you can make albums, slide shows maybe share them with friends and family. That’s just a few suggestions Jeffery Knudsen.